-- Select a Size -- X-Small Small Small/Medium Medium Large - Out of Stock! 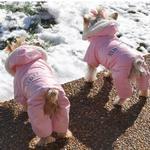 Your pampered princess won't feel like she's "Ruffin It" in our cozy, cuddly dog snowsuit! Tired of those unsightly and painful snowballs that collect on your pup's fur? Our Pink "Ruffin It" Snow Suit by Doggie Design is designed to keep your little girl warm, cuddly and dry on those cold fall and winter days. Your delicate girl will get her second wind even in a blizzard since it is fully lined inside with a very soft and thick sherpa-style fleece. The outer shell is not restrictive since it is made from a soft, flexible water repellent Polyester/Nylon blended fabric. The beautiful pink color is the perfect shade of princess pink! The words "Ruffin It" are silk screened across the back in a cute font with just a touch of attitude. Despite the sentiment, she'll feel pampered even in "ruff" conditions. Don't forget to send us your photos of your pretty girl playing in her Ruffin It Snowsuit! Ruffin It Snowsuit by Doggie Design - Pink Customer Photos - Send us your photo! The fit is perfect and keeps her warm and dry! This is my 2 1/2 year old shorkie Lola and finally, today, 3/21/2018, we got snow! We were very, very excited to finally put on her Ruffin It snowsuit and go out and play in the snow! It fits her just perfectly, and kept her warm and dry as she played in the snow. Miss Lola is definitely a BaxterBoo girl....so keep your awesome clothes coming and Lola will be very happy to keep wearing them! You guys are the best and you have found a lifetime customer here in Elkton VA! 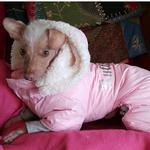 Holly LOVES the warmth and gorgeous pink color of her Ruffin It snow suit!! She likes to be silly in it!! Bleu is a sweet spunky shih-poo puppy who loves to be outside. She lives on the East Coast and it's pretty cold out right now. This coat keeps her very warm and breathable at the same time. I bought another size up for when she grows. Overall, a great buy. shayna and stripe will be 1 yrs old on January 23rd. They are two twin girls with amazing personalities who love wearing clothes. Jordie & Charley don't mind the cold in their snowsuits. Jordie needed a snowsuit the day we got 32" in PA. Despite the drifts, she stayed warm. Maisi is a lucky 4 year old little girl living with 6 Persian show cats. The snow here, in upstate New York, was overwhelming for ALL of us, this year. Lyric is the most stylist dog in the neighborhood. Everyone loves her! Haley's waiting to go out in her brand new snow suit from Baxterboo! My Lola looks so cute in this pink snowsuit. Not sure if I should have chose a smaller size, but this one is good. I tried it on right out of the package (tag & all). She started walking around in it right away! Love it and so soft and cozy. Lola is 5 lbs. of pure fashionista. She likes to dress up but can run with the big dogs any day! Blossom is all set for a big day of agility training out in the January snow.....she may be tiny but she's no weenie with her Baxter Boo Ruffin-It snowsuit. "I'm Ruffin It in my stylin snowsuit...oh can't stay to talk, I see a squirrel!!" This snowsuit fits like it was made for her. She loves it and looks so adorable in it. Here is Zoey impatiently waiting her turn to go 4 wheelin' in the snow. MaggieMae is so warm & comfortable in her Ruffin It snowsuit,since it is so soft and toasty it is the only one she wants to wear. Her matching scarf keeps her extra warm. "Jealous??" Simon of OddBalds Sphynx shows off his comfy new snowsuit to his sister, BareonAss. She later points out that he is wearing pink. Toasty warm, ready for snow!! Blossy Boo isn't quite sure about her new snowsuit,but she sure is toasty warm! Posted On 12/30/18 by Susan M from , Yes, Susan M recommends this product! Bought this snow suit for my 2 Malteses, 5 lbs and 13 lbs (small and large). It is great because its lined with fleece so Its not the polyfill type that makes it hard for the small dogs to walk in. The elastic is great for the fit. I Will order it in another color. Posted On 12/19/18 by Dionna D from , MD Yes, Dionna D recommends this product! Posted On 12/13/18 by chayla v from Ephrata, WA Yes, chayla v recommends this product! Now I don't have to worry bout her shivering this winter and go on a walk with her. Ready for the snow! Posted On 12/05/18 by Judy F from Roeland Park, KS Yes, Judy F recommends this product! Sophie's Snowsuit came yesterday and I just loved it! I love the ease of putting it on her with the large piece of Velcro down the back. She loves it, too, it's so warm and cozy and all ready to wear it in this bitter cold weather. Thank you Baxter Boo! I just referred a new customer and hope she tries something as I am sure she will be pleased. Thank you! Sizes to fit anyone, even a Frenchie, easy on and easy off. I feel pretty in my new pink "ruffin it" outfit. Covers my head, neck, chest, belly and legs with room to take care of business. If I lived in the antarctic I would definitely own one. A MUST HAVE FOR COLD WEATHER CLIMATES!!! Keeps me incredibly warm! Thank you BaxterBoo! Posted On 03/12/18 by Brie from Hamburg , NJ Yes, Brie recommends this product! Excellent product, fit is a little snug. Keeps me incredibly warm and dry. Would submit a pic but there was no option. Posted On 01/18/18 by Laurie H from Allentown, PA Yes, Laurie H recommends this product! Posted On 11/20/17 by Patty from , KY Yes, Patty recommends this product! This snowsuit is darling, but MAKE SURE you order up a size. I bought 3 of these based off the size chart, none fit, returned them and ordered 3 more in bigger sizes. My baby’s girth is 17 inches but the S/M didn’t fit. The M fit her perfectly! Super soft & warm, bring on the snow! Posted On 11/17/17 by Loretta A from Westlake, OH Yes, Loretta A recommends this product! Posted On 11/16/17 by Patricia D from Elkton, VA Yes, Patricia D recommends this product! This will keep my pup nice and warm in the snow...love it! Posted On 11/14/17 by Paula Jean C from NIAGARA FALLS, NY Yes, Paula Jean C recommends this product! The Ruffin It Snowsuit arrived very quickly and just in time for some pretty chilly weather. You can tell my dog was pretty happy as she didn't want to be picked up once because she was cold. I would highly recommend! Posted On 11/09/17 by Tracy Pozayt from Owingsville, KY Yes, Tracy Pozayt recommends this product! This coat has the softest fleece I have ever felt in my life. It is very well made- VERY nice quality- Im ordering another! Posted On 03/15/17 by Lori T from , PA Yes, Lori T recommends this product! its going to snow a lot in the next couple of days here in Allentown she sure is going to wear it. My dog likes to play in the snow but Hates the snowballs that collect on her. she is small only 11 lbs. loove this thanks Baxterboo we both are happy with it. Posted On 03/08/17 by Patricia S from , Yes, Patricia S recommends this product! Perfect fit, looks comfortable, it's soft and warm, easy to put on, good price. Posted On 02/07/17 by lauren Hawkins from allentown, PA Yes, lauren Hawkins recommends this product! Roxy looks so cute in her pink snowsuit a must have. Posted On 01/26/17 by Judy O from Mount Airy, NC Yes, Judy O recommends this product! Posted On 01/15/17 by Vicki J from , Yes, Vicki J recommends this product! Great snowsuit! She's adorable in it, it fits great and no more snowballs in her fur! Posted On 12/15/16 by Vicki J from , Yes, Vicki J recommends this product! Love this snowsuit and so does my shih tzu! Fits great and is nice and warm. Posted On 12/14/16 by Rebecca T from Quincy, IL Yes, Rebecca T recommends this product! 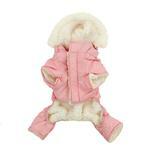 I bought the pink Ruffin It snowsuit for my little Maltese girl last winter. She wore it all winter and it still looks great! I am going to get one for my little boy puppy this year but can't decide on the color. I like the red, my husband likes the black. Great Snowsuit! Posted On 11/24/16 by Eileen Mealey from Marshall, VA Yes, Eileen Mealey recommends this product! I receive the snowsuit today, it looks awesome! The fur on the inside is very soft. I am sure my grand dog Sophie will keep nice and warm in it! Posted On 11/20/16 by Stephanie V from Bay City, MI Yes, Stephanie V recommends this product! I was really pleased with the quality of this snowsuit. Fits my Chihuahua perfectly. It came just in time for the weather change. Posted On 11/12/16 by sandra a from whitestone, NY Yes, sandra a recommends this product! I purchased a snowsuit for my pug...Oh it's perfect...covers her legs and the inside was made with such warm material....My girl will be warm wearing this snowsuit in the snow!! I got the size Small which is perfect for this 5 pound Chi/Pug dog. Posted On 11/07/16 by RIta I from Chalfont , PA Yes, RIta I recommends this product! Posted On 11/04/16 by lauren Hawkins from allentown, PA Yes, lauren Hawkins recommends this product! I can not wait for snow! my dog is 11 lbs i got the medium Love it thanks BaxterBoo. Posted On 10/11/16 by Carol T. from Birmingham, AL Yes, Carol T. recommends this product! The Ruffin It Snowsuit is Adorable! Posted On 09/23/16 by lauren from allentown, PA Yes, lauren recommends this product! Posted On 09/21/16 by Debra K from Dayton, OH Yes, Debra K recommends this product! I absolutely loved the coat! My little Lily Mae is still a little too small just yet, so I just compromised and rolled up the hind legs to make it work. She looks like a little diva! Posted On 08/02/16 by Lauren H from allentown, PA Yes, Lauren H recommends this product! Posted On 08/02/16 by laurie from allentown, PA Yes, laurie recommends this product! Posted On 07/02/16 by laurie from allentown, PA Yes, laurie recommends this product! Posted On 06/14/16 by Lauren H from allentown, PA Yes, Lauren H recommends this product! this snowsuit was a great buy for me b/c i only paid $12, wow that is a great price. my dog Roxy is 11 lbs, 11'' from neck to tail, i have a medium and it fits her pretty good. she has never used it b/c when i got it all the snow was gone. that said i can not wait for some snow to come so Roxy can wear this and play in snow. my dog only has 5'' long leg so she is very close to the ground, i love this snow suit keeps her warm. Posted On 05/16/16 by Laurie H from allentown, PA Yes, Laurie H recommends this product! i bought the wrong size, i still will keep it and find a dog who can wear it, i have bought the right size and can not wait to it snows so she can wear it. Posted On 04/05/16 by Laurie H from allentown, PA Yes, Laurie H recommends this product! I order this snowsuit, turned out to be to big on my dog. to bad because it is so cute. I reorder it in the smaller size, it was a great fit and I am very happy. Posted On 03/23/16 by Joan K from Lakewood, OH Yes, Joan K recommends this product! Well made snowsuit will keep your little dog warm and dry while playing in the snow. The leg covering helps to keep snow ice balls from forming on the warm pet hair when they are out playing for a length of time. Posted On 03/16/16 by Laurie H from allentown, PA Yes, Laurie H recommends this product! Posted On 03/15/16 by Laurie H from allentown, PA Yes, Laurie H recommends this product! I wanted this snowsuit for a very long time. I loved it when i first found it on other stores. That was about 5 years ago. ( to much $ ) forgot all about, until i found this very cute snowsuit at BaxterBoo.com . I still cant believe i got one. When i got it, i had to get the large because that was what you had. It was too big. Went back to the site again to see how to return it. Before doing this i do not know why i had to look back at the snowsuit, on the page I am so glad that i did because it was like magic (1) medium pink snowsuit came up, within minutes of my snowsuit that arrived that day. Instead of dealing with sending it back, i just brought that medium as quick as possible. I am soooooo happy that i did. The only bad part is i have to wait to next snowstorm. It is sooo cute and we get compliments everytime my little shih-poo wears it. if fits perfectly and seems to be keeping her warm in the NY winter. So thrilled w/ this purchase. Love it! I ALREADY HAD THIS FOR OUR ONE DOG AND JUST BOUGHT A 2ND ONE FOR OUR NEWEST FAMILY MEMBER SINCE I LIKED IT SO MUCH. KEEPS THEM VERY WARM AND SO CUTE! Posted On 02/27/16 by Susan G from West Lawn, PA Yes, Susan G recommends this product! Jordie was happy to try out her new snowsuit in our 32" snowfall. She managed to get it muddy while on our walk, but it washed well and she enjoyed wearing it on her next snow outing. The pink version lacks the outer D ring her brother's matching black snowsuit has. The sewn-on loop would have made this snowsuit better as she would not have needed to wear a harness on top of it while walking. Posted On 02/09/16 by Mary B from Washington, DC Yes, Mary B recommends this product! OMG! This is the "bestest", to quote my grandsons! Easy on and off. I purchased a 'Large", wish it was available in an 'X-large" to give my 'Muffie' a little more room (28- lb. Schnauzer-Terrier mix and has a little tummy). I can close it all the way down with the Velcro strips (the strips end right at her tummy; she is about 19" in length, 20" around the chest, but leave the bottom open. There is still adequate underbelly protection). The "Large" goes up to 25 lbs., but nevertheless, fits well, looks good. The inside is thick and warm. The length of the arm and leg sections provide coverage for her front paws and hind legs. The outer layer is water repellent and wipes clean. I am very pleased with the purchase. Ordered one for my 'granddog' too. Everyone comments on how cute the suit is. High-fashion, excellent quality 'girlie' outfit! I'm loving it! Well done! The snowsuit fits my Bella perfectly. The lining is incredibly soft. It is warm without being constricting. Bella usually hates hoods, I think because they are often very big. This is a good size & the color is a pretty baby pink. The only thing I would change would be to leave off the words on the back. Posted On 01/23/16 by Maria N from Yorkville, IL Yes, Maria N recommends this product! Posted On 01/22/16 by Michelle S from Buffalo, NY Yes, Michelle S recommends this product! Great little snowsuit. Size small/medium fits my 9 lb chihuahua perfect!!!! Posted On 01/14/16 by Lisa H from Riverside, CA Yes, Lisa H recommends this product! This snowsuit is cute! The inside is so soft. However, it ran a little small so I am reordering a larger size. Posted On 01/05/16 by Mary L from Ansonia, CT Yes, Mary L recommends this product! I love this coat and so does my baby. I had to alter it because she is so short but it was 18 degrees today and she looked like she was on a beach. Great purchase, very happy!!! Posted On 12/23/15 by Genesis Zagal from Garden Grove, CA Yes, Genesis Zagal recommends this product! Posted On 11/13/15 by mary from Highlands Ranch, CO Yes, mary recommends this product! I bought 3 for my 2 Maltese and a Yorkie terrior mix. They fit perfect. They cover all 4 legs, so that way my Maltese don't get all those balls of snow all over there legs. The best investment I ever made for my little angels. This snowsuit is so adorable on my white poodle, Coco Chanel. She has worn it on a chilly day down here in sultry Louisiana. Posted On 11/02/15 by Sandra P from Arrington, VA Yes, Sandra P recommends this product! Posted On 08/25/15 by Angela L from Powell, OH Yes, Angela L recommends this product! My little Chihuahua SOPHIE looks adorable in her new snow suit! It fits her perfectly. I would recommend this for any small dog who hates the winter cold. Posted On 08/06/15 by Yvonne P from Titusville, PA Yes, Yvonne P recommends this product! Posted On 06/29/15 by Erika P from Wheeling, IL Yes, Erika P recommends this product! We just love this snowsuit!!!! Will order again! Thank you! Posted On 05/16/15 by Annmarie K from Santa Clara, CA Yes, Annmarie K recommends this product! This snow suit is a wonderful item for my 5.5 lb Papillon-Chihuahua mix. I have only had large dogs prior to Roxy & did not know how chilled tiny dogs get, even in temperate weather. This suit is perfect for chilly winter weather (& cool spring evenings) that Roxy does not tolerate well. And she is really cute in it. This was a little large in the neck for my Yorkiepoo, but the length of 13 "', was perfect. I got it in pink, because blue was sold out. My husband said, he would not walk our male if I put it on him. So, to take care of the problem, I accent with light blues and now he looks like an Easter Egg. All in all a great product, fits great and our little male loves it. Posted On 03/02/15 by Angie N from Alamogordo, NM Yes, Angie N recommends this product! I love this snowsuit. It is made very nice. High quality and the small fits my six pound Chihuahua perfect. Posted On 02/28/15 by Kathleen S from Bethesda, MD Yes, Kathleen S recommends this product! Buttercup looks adorable. The s/m size fits my Maltese perfectly and is snuggly soft, warm and well made. Great for this snowy winter! Posted On 12/25/14 by Tracy P from Anchorage, AK Yes, Tracy P recommends this product! Posted On 12/02/14 by Angela V from College Point, NY Yes, Angela V recommends this product! This is the second snowsuit like this I've bought for my Bijon, Ruby. It keeps her warm and she looks sooooo cute!!!!!!!!!!!!! Other dog owners always stop me and ask where I got it and I tell them go on Baxter Boo.com !!!!!!!!!!!!!!!!!!!!!!!! Posted On 11/23/14 by Karen R. from Madison, WI Yes, Karen R. recommends this product! My toy poodle Opal, who I rescued 2 years ago, looks adorable in her pink Ruffin It snowsuit. I was impressed with the quality of the product and it will most definitely keep her warm in the bitter Wisconsin winters. I have another rescued toy poodle, Topaz, who has another snowsuit and the quality is not the same, so I will be ordering the Ruffin It pink snowsuit for her as well. Posted On 10/21/14 by Karen S from , MN Yes, Karen S recommends this product! Accurate details, fast shipping. Pleased with item. Posted On 10/15/14 by Wendy M from Teulon, Yes, Wendy M recommends this product! Posted On 02/11/14 by Haley A from Jersey City, NJ Yes, Haley A recommends this product! I measured my 9.5lb shih tzu girl as the website described and ordered size s/m according to that. They fit so well I was really happy. It's super warm my girl doesn't shiver anymore! Love that these have all four legs covered. It also has a D ring to attach a leash which was good because due to the suit's thickness, her harness didn't fit. Since it's pink, it gets super dirty from snow/puddle after just one walk but I was able to wipe the surface clean with baby wipes. Pink is just so pretty on her. I love it!